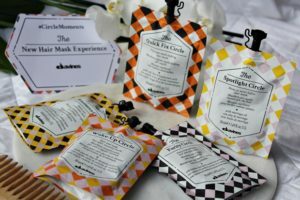 The Circle Chronicles, the newest launch from Davines, is a collection of hair masks designed to keep up with your rhythm and impromptu needs. These five brand-new masks were created to address different hair care concerns, all with a common denominator: immediate performance—10 minutes or less. Formulated in the Davines laboratories in Parma, Italy, The Circle Chronicles are multi-use compact packets that were designed to address the needs of the moment and were created with convenience in mind. Each mask is unique and dedicated to a specific need, but there might be a need to use more than one at the same time. The beauty of The Circle Chronicles is that you have the option for quick and efficient multimasking treatments, and at the same time you can address your different hair needs, all within the setting time of a single mask. Now available at Salon True. A creamy white color mask created to bring extra shine and instant brightness to the hair, enhancing natural or cosmetic color. This mask has an excellent conditioning effect, leaving hair moisturized without weighing it down. Rich in fatty acids, vitamins and proteins, the Moringa oil in the mask helps to enhance hair shine while also providing deep nourishment. Express moisturization, detangling and shine in only three minutes! Enriched with hyaluronic acid with strong moisturizing power and 100 percent natural red clay, rich in iron, which gives it an ochre colour, to remove hair impurities. For when your hair is paying the price for a hyperactive lifestyle and you’re looking to remedy any brittleness and damage. Formulated with highly nutritious Babassu butter and yellow clay: the Babassu butter works as a detangler to restore softness, silkiness and body, and the copper and iron-rich yellow clay helps to recompact the hair structure, making it look healthier and stronger. Sometimes a break is needed. After a long trip or a stressful experience, take a moment to relax and recharge. This purple-colored mask was formulated for the stressed scalp and hair in order to bring tone, volume and help to regain lost balance. Formulated with Rhodiola extract and purple clay rich in kaolin and aluminum with rebalancing and anti-toxic properties. Created to remove scalp impurities caused by atmospheric pollution, the Purity Circle is enriched with matcha tea and 100 percent natural eco-certified bamboo charcoal. Matcha is a well-known super food with polyphenols that fight free radicals that come from pollution, and the bamboo charcoal which gives the mask its characteristic black color acts as an absorbent.